How do you organize a desert rave in a country where such events are illegal? If you’re Tehran techno DJs Anoosh and Arash, who perform under the monikerBlade&Beard, the answer is: very carefully. A new documentary, Raving Iran, opens with the duo planning a clandestine party—weighing the risks of who to invite, and what happens if they’re discovered by the cops. Advice flows in streams—separate the men and women, claim it’s a wedding, ask the girls to have their hijabs ready. As much as Anoosh, Arash, and their patrons might love deep house, the Iranian government isn’t quite as sold on the genre—only classical and traditional music are permitted by the country’s regime. Despite the dangerous consequences of getting caught by vice squads, there’s plenty of artists operating underground, and the image of contemporary Iran in Western media has changed slowly in recent years. Instead of the stagnant picture of an oppressed society, stories are emerging offering a glimpse at the fashion, culture, music, and social lives of young Iranians. In 2013, Swiss director Susanne Regina Meures travelled to the country to document the story of Anoosh and Arash, whose passion is deemed a political transgression in their native country. When the duo are invited to play at Zurich’sLethargy Festival, it’s the chance of a lifetime for them—but they have to decide if it’s worth leaving their homeland, possibly forever. We caught up with Meures recently at Toronto’s Hot Docs Film Festival to speak to her about her filmmaking experiences in Iran and find what Anoosh and Arash are up to these days. THUMP: How did you come about making a film about Iranian electronic musicians? Susanne Regina Meures: I read an article in an English magazine five years ago about techno parties in the Persian desert. I got this picture in my head of mini-Burning Man festivals in Iran, which has one of the most oppressive regimes in the world. On Facebook I found all these kids [in the scene] and then I flew to Tehran and met loads of them. Of course it’s really risky for them to speak openly. But in the end, Anoosh and Arash did it. We had to pixelate their friends in the film and find different ways of disguising them. What did Anoosh and Arash’s families think of all this? I’m sure they weren’t agreeing with everything their children were doing, but also felt that Anoosh and Arash were old enough to be responsible for their actions and make their own decisions. How did you manage to shoot all of the events in the film given that you were based in Switzerland? I went [to Iran] in April 2013 and then returned in September. I went five times in total, and each time stayed for a month or two. So all of that stuff happened during shooting. They could have ended up somewhere else but I was prepared to follow them anywhere. Had you been to Iran before? I’d been one time before. To be honest I was very lucky because every time I always got a visa, I wasn’t sure if I would. I also think it was also an advantage that I was flying from Switzerland, because the political connection is quite good. It would have been different if I’d gone from the UK, and probably even worse from the US. What were your interactions with the police like? We constantly got stopped by the police. After shooting, I always replaced the memory card with the footage with a card with tourist shots. The memory card with the footage I hid in my bra. Also, going in and out of the airport was always followed by a thorough luggage check. But apart from tons of Swiss chocolate (going in) and Iranian nougat (going out), I had nothing to present to the border control. I love the sequence in the Ministry of Culture and Islamic Guidance (Ershad) building when they try to become “legit,” followed by those scenes where they’re attempting to do normal musician activities like trying to get CDs or event flyers printed, but keep getting turned down by shop owners. The repetitive nature really gets at how trying it is to be an underground musician in Iran. Shooting at Ershad was the most complicated thing we had to do, and took six weeks of preparation. We went there many times just to see what the building looks like, or to find out are we actually getting searched going in? I wanted to use radio mics, so I got a shirt made at the bazaar for the iPhone camera, and I went ten times to get it adjusted to get the perfect fit. I also went there with Anoosh to check everything out, because you have to keep a certain distance from everyone [to shoot properly]. And it’s the kind of place where one day it would suddenly be closed, or the right person wouldn’t be there, and so on. It was an absolute nightmare and it just had to work out. Someone says in the film: “They love to be lied to.” It’s such a great line and very astute observation. So many Iranians employed to enforce rules recognize they’re arbitrary, and so when people lie to them—and everyone does at some point—they’re fine with that because they can claim ignorance if they were ever called on it. Absolutely. The picture in the Western media is this oppressed society—and obviously that’s true—but we don’t see the parallel life everyone is living. It’s this parallel life covered by a very small layer of regime. So everyone finds their way of leading a normal life. This is what I liked with the cafes and printers—they’re saying no but you can tell they’re considering it. On their Facebook page, Anoosh and Arash recently posted a photo with them holding some kind of legal document—what’s their status now? Did they get social asylum? Yes, they’ve been staying in this refugee camp in the mountains. It must have been really hard for them, because they’re these two kids from Tehran, and they’ve been surrounded by cows and sheep for the past two years. But they got their positive answer: they get refugee/identity cards and they can actually stay in Switzerland. So that’s really good news. 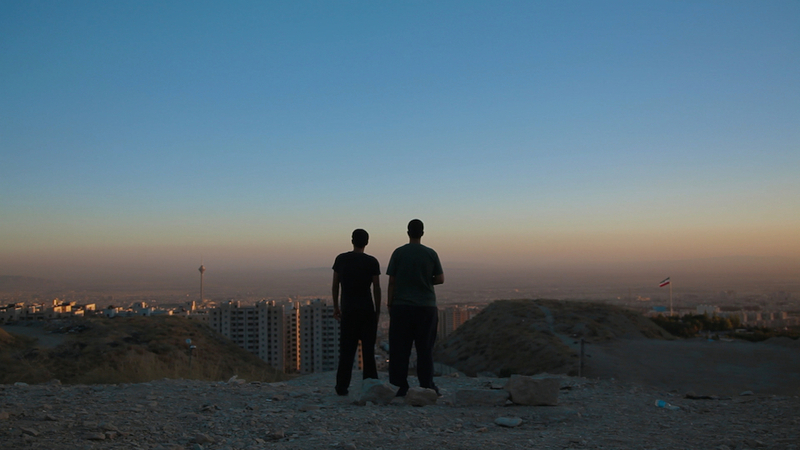 Raving Iran plays at Hot Docs on Saturday, May 7. It will screen at DOK.fest in Munich, Bel Docs in Belgrade, and several other festivals before being released theatrically in Europe. It has not yet been picked up for distribution in North America.